Nail polish addicts are most likely already aware that the caviar nail is the new it look as the polish industry continues to thrive in the beauty business impressively, but with its somewhat high maintenance appearance, at first glance, it looks like a manicure catered to the trendy socialite crowd (or at least those young girls from Japan that obtain that “wicked cool” style as Gwen Stefani homaged in her song “Harajuku Girls”). As elite as the caviar manicure can look, it is picking up medium speed in popularity with beauty blogs posting tons of pics of DIY art work and brands like the Parisian Ciate selling starter kits with all the tools and suggested polishes you’ll need to achieve the 3D, nail art feat. A year and half ago, it was all about the return of the Shatter effect, heralded by OPI, which lead to the faded Magnetic overcoat introduced by London’s Nails, Inc., and now it’s about caviar fingertips adorning your held glasses of future and savory champagne. The caviar look is basically a nail loaded from edge to edge with micro-beads (or to be frank about it, tiny fish eggs, hence its name after the ye olde fancy dish “caviar”). You can possibly be a lot more creative with the caviar nail as access to letting your imagination go wild is tangible since Shatter and Magnetic were more restricted (but this depends on what you come up with!) Though this manicure can come across a bit gaudy, it’s also vibrant and quirky, basically the nail set equivalent of the temporary lip tattoos, brought on by Violent Lips. Ciate is currently and exclusively availale at Sephora for $18, but those some loyal beauty followesr questioning Ciate’s claim to the caviar technique first, with any art supply store, section, or even at your local grocery store aisle, you could use sprinkles or jimmies sitting next to the icing and cake mix to get a similiar effect (but be careful with this get a cute mani quick scheme; this could really turn your look from gaudy to tacky. Try to get the tiniest sprinkles possible), you too can create your own caviar nails. TIP: You can always do just one nail on each hand, which definitely gives the tired one differently painted nail colored finger a kick (remember that fad?) TIP: Give your nails 15-20 minutes to dry completely. Remember to have fun and to maybe take it easy the first day with your hands since it’s not the most practical manicure! Here’s to those (champagne wishes and) caviar dreams, y’all. 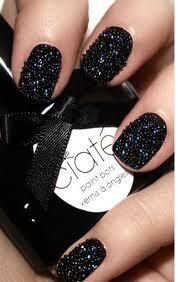 Check out the slideshow below of some caviar nail ideas and results, and tutorial straight from Ciate’s YouTube video. Previous Previous post: Crayons for Lips!